Do you know Patti? We think you should! She has volunteered with us for over a decade, though this past year and a half she’s really stepped up her commitment. In short, Patti supported every major event in the last year in addition to joining our fundraising committee. Amazing! Patti brings enthusiasm to our volunteer program, in addition to a lot of laughter. Her passion for advocating for others to be active and connected in their communities is inspiring. 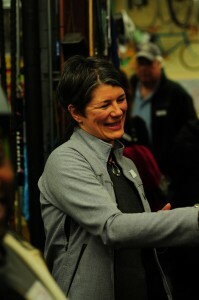 She’s also known for cleaning a whole bunch of wheels at Cycle Oregon, articulating the finer points of her bike’s Ergon pedals, and making hundreds of kids and adults feel welcome in the Family Reception Room at our annual Holiday Bike Drive. I first came to volunteer with Community Cycling Center in 2001. Being new to Portland, I wanted to meet other bikey types and I enjoy volunteering. I’ve really enjoyed getting to know the other folks connected with Community Cycling Center. We’re a really amazing bunch of people! There are folks I see regularly now and others I bump into on occasion but it definitely feels like a community. Mostly I help at the events – Holiday Bike Drive, Worst Day of the Year Ride, Cycle Oregon Weekend and Week Rides, and I have been on the Community Connections Committee for a year. Last year, I got to help deliver Willamette Week Give Guide donor gifts. It was fun riding around with a pannier full of presents. Most people had forgotten they would be getting anything. As it was the weekend before Christmas, it was like being Santa. My two years at Cycle Oregon have been brilliant! It’s the most fun you can have while being sleep deprived and the crew both years have been wonderful. Getting to talk with people from all over about the great things the Cycling Center does is fantastic. I don’t know if I can pick one “moment” out. After my first year, I was excitedly telling a friend about 8 hours of bike details, adding that I couldn’t wait for next year. His response was “maybe they will give you a better job next time.” I guess it takes a certain “type” of person. Everything the Community Cycling Center does is great and I love telling people about what we do, but Holiday Bike Drive will always be my favorite. There is nothing better than seeing a kid get a bike. When you multiply that times 400+, it’s just mind blowing! I would love to have a custom built bike – a Sweetpea made by Natalie Ramsland, in particular. But even then I would want it to magically do everything from road to mountain biking. My current bike is a Long Haul Trucker and she is a dream to ride, so I am pretty happy with that, for now. I work in Social Services full time at an outpatient medical clinic at Legacy Emanuel. I also volunteer teaching yoga to women in resident treatment for addictions through Living Yoga and am on the advisory board of the DAYA Foundation. We are working to make yoga more accessible to the general public, particularly those with physical or social barriers. Otherwise I enjoy time on my bike, visiting with friends, getting out to enjoy all of our amazing outdoor activities in the Pacific North West, and learning new things. I am a perpetual student of something it seems and would love to learn more about bike repair (guess I should start coming to volunteer on Tuesdays).